The search for hidden Guardians of the Galaxy Easter eggs continues for fans of the Marvel Cinematic Universe and, while the infamous egg from the first film remains a complete mystery, a couple of folks on Reddit have a great theory about a reference from Vol. 2. This new Easter egg hints at the origin of the fan-favorite Taserface (Chris Sullivan), a character that we may or may not have seen four years earlier than we thought. 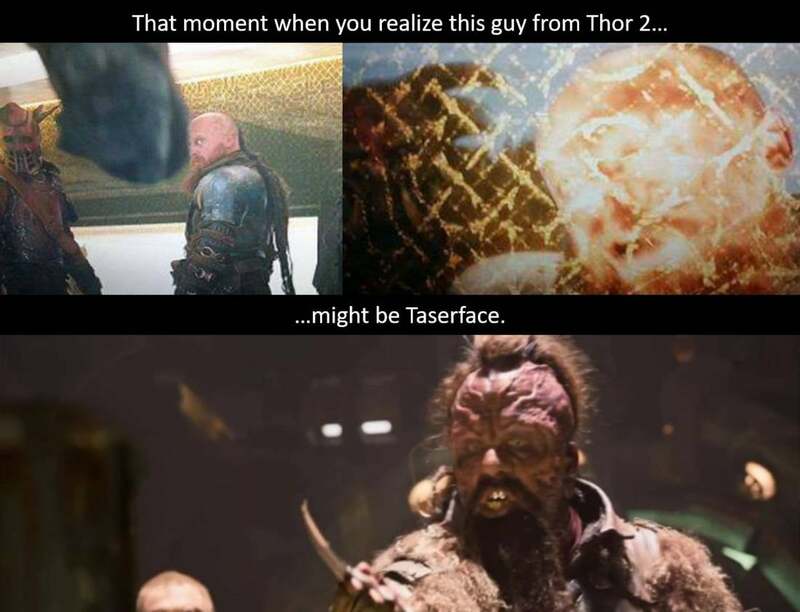 So the theory suggests that Taserface actually made his MCU debut back in 2013 in Thor: The Dark World. While Chris Sullivan wasn't in the film, there is a side character that matches the style of his villainous Ravager, and the scene where he appears actually gives a solid origin to his trademark style and nickname. Perhaps Taserface wasn't a chosen nickname after all, but rather an earned moniker based on what happened to him on Asgard. One Reddit user took to the Marvel Studios subreddit this week to share the theory, including a photo that helps explain where the idea came from. Take a look at the image below. Think back to Thor: The Dark World, specifically the scene in which Loki is imprisoned on Asgard. Kurse is enclosed in another cell, along with several other inmates. As we all know, Kurse orchestrates a breakout and uses one of the men in his cell to do so. He presses the man's face up against the laser enclosure until he gets the door open, then tosses the man aside. Get a good look at the man in the corner of the cell. He's the same size as Taserface, similar in both height and stature, and he's got the same exact hair. It's also worth noting that the dude is clearly a criminal, just like Taserface. To take things even further, the nameless character gets his face absolutely demolished at the end of the scene. One the lasers burn his mug he's tossed to the side and no one gave him a second thought. However, as this theory suggests, the man could have gotten up later on and escaped the prison, following Kurse and the other criminals. With a face that was completely torn apart by lasers, he might have decided on a new nickname to match his unfortunate style. What do you think about this theory? Is there a chance we saw Taserface debut in Thor: The Dark World? Let us know in the comments!